DALLAS TO ALBUQUERQUE IN UNDER 5 MINUTES! Yeah right! Not even Bugs Bunny could get there that fast. On our way to Colorado for a much needed vacation I decided to capture it via a time-lapse. I have done this drive before, it is long, but usually flies by. I typically listen to podcast like Elvis Mitchell’s The Treatment, or Apple’s Meet the Filmmaker. 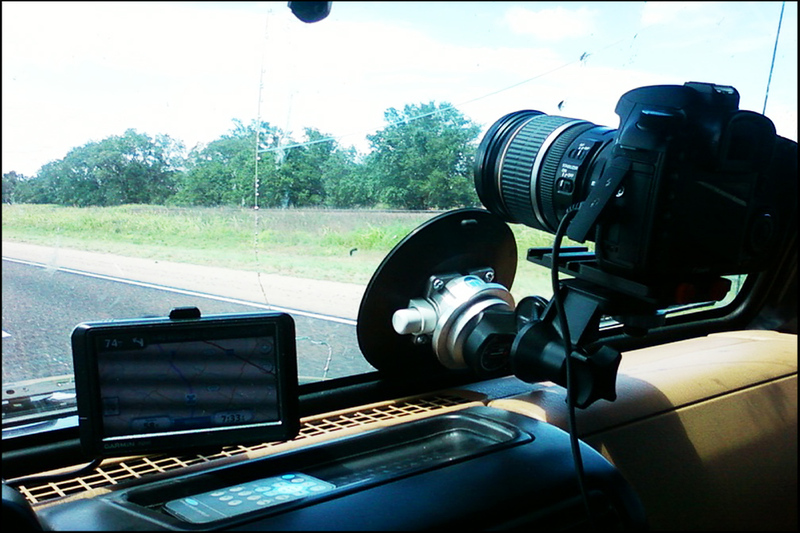 Filmtools makes a really dependable suction mount for only $90. I have used this multiple times, and have yet to loose a camera. Granted you do not want to put a large camera on it, but for DSLR’s it works great. The way it suctions to a surface is with a pump. In the picture you can see a little gray button sticking out the left side. This is the pump. You press in over and over to create the suction to the surface. The red line on the button is a way to monitor it when it is beginning to loose pressure. On my trip I did not have to pump it much at all, even with all the bumps. The trip was about a 10 hour drive. I made a few stops here and there, as you will see in the time-lapse. I used my cheap, meaning inexpensive intervalometer, and 2 Scandisk Extreme IV 16gig (45mb) cards, and a Kingston Elite Pro 32gig (133x) card. I used 3 batteries. The lens being an IS lens I am not sure really help as the bump ride was a lot on the camera, and the fact that it was in a Jeep. Below is my set up, taken from my phone. 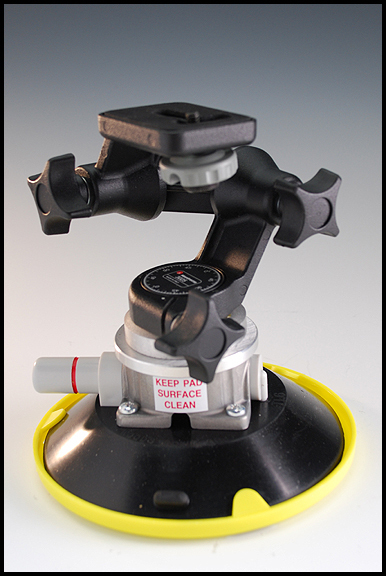 One of the knobs on the suction mount did start to come loose after 5 hours, but that is an easy fix. Though the video looks like I am speeding, there was only one time that I sped. I did not see the speed limit sign change to 60. And yes, I got a ticket for it. 70mph in a 60mph zone. Cop was friendly but not forgiving. During the time-lapse, I encountered a thunder storm, and an accident where a guy’s car spun off the road. A truck driver and I stopped to help, but he was able to get it back on the road. Enjoy. Dallas to Albuquerque from Unblind Productions on Vimeo. I’m curious about about this setup. You shot a picture every “how many” seconds? What size image did was the camera set to? I’m assuming since you weren’t going to do any post zoom or panning, you used a smaller image size to get more on cards. How many images were in the final timelapse? Hey Mark, I set the intervalometer to shoot every second. I wasn’t sure if in the future I would want to zoom or pan the movie for another project, so just in case, I set it to shoot as large files. Come back soon. I shot some other timelapses that have turned out amazing. Oh, and it took 16,653 images. Sorry for the tardy thank-you… I’ve been away for a bit. Thanks for the additional info, I’ll have to check out the other timelapses.